Some of you may already be familiar with the reality television series Recipe to Riches on Food Network. In this show, competitors from across Canada battle it out in the kitchen to come up with a winning dish that will be sold under the President’s Choice banner. If I’m writing about this today, it’s not because I’ve watched all the episodes (in fact, I haven’t even seen one), but because I agreed to review the finalists’ products that Loblaws (the supermarket chain that sells President’s Choice products) sent me. In fact, due to my weekly column in the Journal de Montréal and my Pestoblog, I receive samples of food and non-food products from time to time that different companies send me in the hope that I’ll quite simply ‘talk’ about them (preferably in glowing terms ;)), to help promote them. To eliminate any doubt in your mind, I’d like to make it clear that I don’t get paid for it! I must say that we enjoyed ourselves, but… unfortunately we did not eat well. Perhaps we are just too used to eating sensibly, because we eat the SOSCuisine way, which means freshly cooked food that is tasty and good for health ;). But hey, we promised to assess 7 products and we did. With regard to taste, the team was unanimous in awarding the prize to the Butter Chicken Lasagna. If you are interested in knowing more, visit Recipe to Riches. You have until Friday, 7th December to vote for your favourite product. The grand finale will take place on Wednesday, 12th December at 9 p.m. The winner from among the seven episode finalists will receive $250,000 and his winning dish will be sold in all the Loblaws across Canada for the coming year. As for the other products, they will remain available if sales indicate that they are popular! 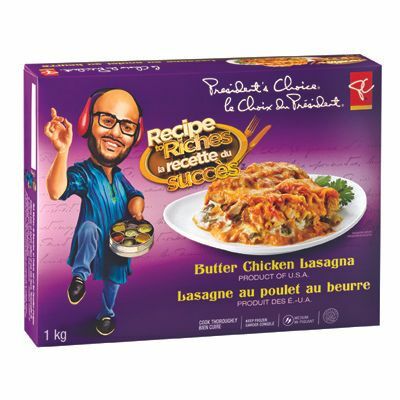 It is indeed the Butter Chicken Lasagna that won the grand prize. Congratulations to Rick Mantharu of Brampton,Ontario.